40 years ago today British fascism suffered its most humiliating defeat since Cable Street. Forty years ago today, the National Front attempted to organize a national demonstration through Lewisham, a multi-racial area of southeast London. Against a backdrop of deep economic crisis, its aim was to intimidate the local black community and provoke conflict. A year before, in a local council election, the far right had secured almost half the vote — the stage seemed set for a foothold in Britain’s capital. In the years following their establishment in February 1967, the National Front (NF) wasn’t taken seriously as a political party. A merger of various fascist sects — the League of Empire Loyalists, the Greater Britain Movement, the Racial Preservation Society — it was widely considered a way station for crankier elements left out by Oswald Mosley’s British Union. However, from those who remembered the threat posed by even fledgling fascist forces, the NF faced serious disruption from the beginning — including Jewish self-defense organizations such as the 62 Group. Lacking in coherence and unable to demonstrate in public, the NF struggled to develop into a politically meaningful force on the right wing of British politics. This changed in April 1968 with the infamous “Rivers of Blood” speech by hard-right Conservative MP Enoch Powell. With fascist rhetoric in the mainstream, the National Front capitalized — particularly when it became clear that Powell’s speech had achieved some resonance with white workers in Britain. Fascist leader John Tyndall, who would later go on to chair the National Front, predicted that they, and not the Tories, would be the beneficiaries of Powellism—and was swiftly proven correct. The following two years saw a steady growth in NF membership, as well as slew of defections by lower-profile but important local Conservative Party functionaries. By 1970, the NF was prepared to field 84 candidates in the general election, averaging a modest but significant 5.2 percent of the vote. As the seventies continued, it grew dramatically, benefiting from national political unrest, escalating conflict in the north of Ireland, and its own activist work — such as the campaign to resist the entrance of Ugandan Asian refugees into Britain in 1972. The following year, the party made a conscious shift towards a working class constituency, embracing a slew of left-protectionist economic policies and establishing a National Front Trade Unionists Association. At the West Bromwich by-election in May 1973, the NF turned heads by scoring over 10 percent in what had been a safe Labour seat. British fascism was making itself relevant, taking advantage of rapid demographic shifts and latent racial prejudices. By 1976, the National Front could claim around 14,000 dues-paying members. In the May 1977 local elections, it took 119,000 votes in their Greater London Council elections, and gained nearly 20 percent of the vote in some areas of Leicester, a city with a large Indian immigrant population. Given its sizable vote in the capital, it was no surprise that the NF sought to target ethnically diverse south London as a base for a political breakthrough. Seeking to fully exploit tension over growing unemployment and issues related to housing, it courted disenfranchised voters using the specter of “muggers” — an unambiguous dog-whistle — who were responsible for the breakdown in the moral, social, and economic fabric of British society. In response to growing tension in the area, the local labor movement established a broad All Lewisham Campaign Against Racism and Fascism (ALCARAF) to monitor the far right, encourage better community relations, and maintain vigilance against its street campaigns. But the National Front was having an impact. 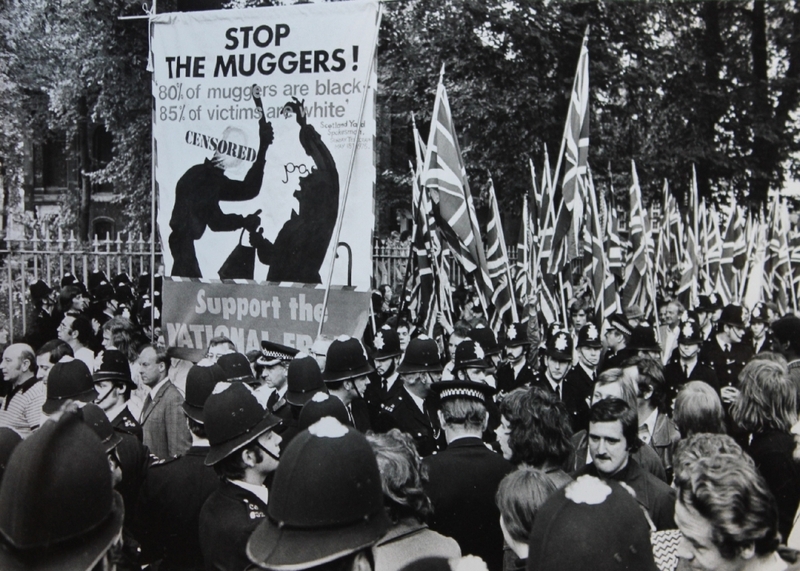 It focused on spurious narratives of black criminality which, added to their electoral rise, contributed to a moral panic about “muggings” that the British establishment was willing to indulge. In May 1977, the London police force carried out dawn raids on the homes of scores of black young people. In the end, twenty-one young residents of Lewisham were handed a dubious charge of “conspiracy to steal.” A community campaign was launched to defend the “Lewisham 21,” and the group began to hold large-scale public meetings on the High Street to discuss and propose how to push back against the charges. This activity galvanized the local National Front, which began to organize paramilitary-style attacks on the meetings in order to break them up. One relatively small march by the Lewisham 21 Defence Committee was attacked by 200 NF skinheads, leading to over eighty arrests. The fascists also began to attack socialist paper-sellers on a daily basis, embarked on a terror campaign against black and Indian shopkeepers, vandalized a local Sikh temple, and firebombed the local offices of Trotskyist group Militant Tendency. It was in this context that the National Front announced their intention to march through Lewisham on August 13th. Under the slogan “Muggers Out,” the intention was to provoke the black community, and to encourage serious racial conflict. The response of the local labor movement to this serious provocation was varied. The ALCARAF immediately announced their intention to hold a peaceful protest on the morning of the 13th. As a broad front, the ALCARAF enjoyed the backing of the local center-left council, the Labour and Liberal parties, the Communist Party of Great Britain (CPGB), and various local churches — guaranteeing serious community support for their activities. However, this latest provocation in Lewisham had created a feeling of popular anger. The mood was no longer one of piecemeal opposition, but of a need for confrontation. Earlier in the year, a National Front march in the area of Wood Green in north London had been met with fireworks and rack upon rack of shoes thrown by local antifascists from a nearby shop. These actions successfully disrupted the march, which ended in failure. The Socialist Workers’ Party (SWP), a Trotskyist organization with a growing base in London, recognized this emboldened mood to take on the fascists directly. Knowing that they could rely upon the support of various members of the Lewisham 21 Defence Committee and thousands of local youths, the SWP amplified calls from local militants to occupy Clifton Rise, the area where the NF were intending to march. Despite their publicly stated tactical disagreements about how best to deal with the fascists, both “sides” of the antifascist effort ultimately recognized the legitimacy of each other’s positions. An agreement was reached between the two differing groups that the ALCARAF demonstration would be timed to finish in order for those who wished to join the SWP mobilization at Clifton Rise. In the buildup to the demonstration, tension was mounting in the locality. There were reports of violent altercations in pubs and underground stations between fascists and antifascists. The first incident on the 13th occurred at three in the morning, when the prominent Communist and ALCARAF member Mike Power had bricks thrown through his windows. At least twenty blokes in balaclavas, crash helmets, and scarves were attacking the vehicle and its occupants. I stopped dead in my tracks and watched as iron bars and wooden poles rained down on the NF supporters who had not managed to make it back on board. The others cowered inside as the side windows were smashed, and I’m sure someone was attempting to drag one of the NF guys through the broken windows. By 11:00 a.m., a crowd of four thousand people had amassed to oppose the National Front, led by Bishop Mervyn Stockwood, Mike Power, the Labour Mayor of Lewisham Roger Godsiff, and Martin Savitt of the Jewish Defence Committee. The demonstration passed without serious incident, and local militants met a positive reception when encouraging people to go to Clifton Rise. The mood, however, was tense. The police had deployed modern riot shields for the first time on the British mainland, which was to foreshadow the intensity of the coming events. By early afternoon, the number of antifascists waiting for the National Front to arrive at Clifton Rise was somewhere in the region of three to six thousand. When they eventually did arrive, a shower of bricks, bottles, and smoke bombs greeted them, causing scores of injuries. The police quickly became agitated, and wanted to disperse the crowd, making charge after charge. Young antifascists were breaking through police lines and reaching the fascists, breaking off pieces of nailed-down wood to attack them, while left-wing football hooligans attacked the flag-bearing “Honour Guard” of the NF, stealing and setting alight their branch banners and Union Jack flags. There was a bit of fighting but most of the [fascists] were so terrified that they just ran away. I have to confess I didn’t have a clue what to do in the middle of all this. I caught the eye of this one particular [fascist], a big, scary-looking middle-aged bloke. He just turned and ran off down the road. Most of his mates did the same. In a time of pronounced social crisis in Britain, the reaction of the media was unsurprising. The Daily Mail saw the police as the main victims of the “red storm-troopers” who had utilized an “un-British” method of political violence on opponents. More ominously, the Tory-leaning Daily Telegraph appeared to sympathize with the National Front. Expressing disgust at the idea that “native-born Englishmen [be] denied the right to march through a part of their city merely because it is settled by immigrants,” the paper floated the idea of a ban on Communist and SWP demonstrations. Full of excited conversation… it seemed like everyone had a tale to tell. “Did you see that guy with the big plank of wood having it on his own with the NF,” said one of the lads, “and the only one who had a poke back at him was some old fella. Well I saw him later and he said that the bloke he was hitting was one of his old teachers. It was this type of excitement and a shared sense of victory that mattered to a whole generation of people who were soon to be culturally radicalized by the anti-racist politics of the Anti-Nazi League (ANL) and its “punk” wing, Rock Against Racism (RAR). In the pubs, music venues, and football terraces, a sustained campaign for the hearts and minds of young, working-class Britain significantly undermined British fascism’s morale and organizational capability. But it didn’t do it alone — a lesser-known but important campaign of physical disruption of fascist activity by the now-notorious “squads” was an essential accompaniment. The Battle at Lewisham shaped the national political dynamic. Not only was the National Front’s sense of momentum shattered, but it had faced humiliation by being defeated on the streets by its opponents. The struggle was widely credited with easing racial tensions in the area, partially due to the unity of young Asian, Irish, and black people in fighting fascism, but also due to the intimidation local fascists now felt in areas they had once terrorized. Furthermore, the violence associated with the National Front began to dent their electoral standing in the eyes of the imperial-minded, radicalized Tory voters who had once supported them. When Margaret Thatcher began to adopt the rhetoric of the far right several years later — describing Britain as being “rather swamped” by “people with a different culture” — the moment for these voters to return to the Conservative Party was heralded. Voting for the chaotic National Front over a viable, racist Conservative Party seemed less of a political option. The experience of antifascism in this era left a bitter taste in the mouths of the British far right. For Martin Webster, a leading light of the National Front, the antifascist movement had “dashed” their recruitment chances. Its propaganda war to equate “NF” with “Nazi” cut away at their reputation in working class areas. The stance taken by antifascists at Lewisham was a source of inspiration to thousands. In an era where hundreds of people chant “blood and soil” in American cities, we would do worse than to remember this proud episode — and its lesson, that the tables can be turned against an emboldened fascist movement. Padraig O'Neill is a care worker from Salford. He is involved in Street Edge, a socialist sports and boxing club in Manchester.